A Gantt chart helps you schedule your project tasks and then helps you track your progress. 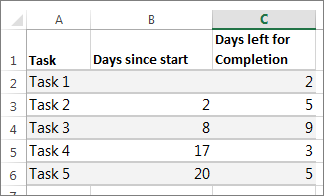 If your data isn't in a continuous range, select the cells while holding down the COMMAND key. Tip: If you don't want to include specific rows or columns of data you can hide them on the worksheet. Find out more about selecting data for your chart. Click Insert > Insert Bar Chart > Stacked Bar chart. 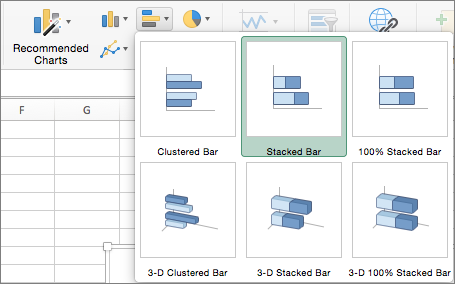 Next, we’ll format the stacked bar chart to appear like a Gantt chart. In the chart, click the first data series (the Start part of the bar in blue) and then on the Format tab, select Shape Fill > No Fill. If you don’t need the legend or chart title, click it and press DELETE. Let’s also reverse the task order so that it starts with Task1. Hold the CONTROL key, and select the vertical axis (Tasks). Select Format Axis, and under Axis Position, choose Categories in reverse order. 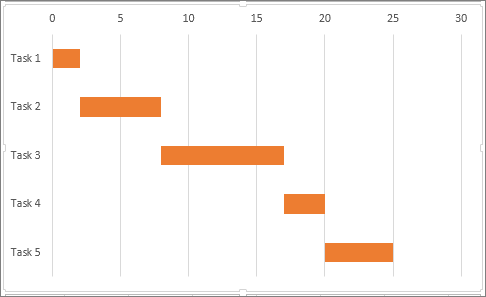 You can customize the Gantt type chart we created by adding gridlines, labels, changing the bar color, and more. To add elements to the chart, click the chart area, and on the Chart Design tab, select Add Chart Element. To select a layout, click Quick Layout. To fine-tune the design, tab through the design options and select one. To change the colors for the chart, click Change Colors. To reuse your customized Gantt chart, save it as a template. 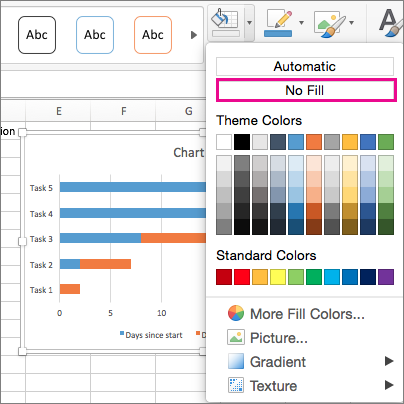 Hold CONTROL and click in the chart, and then select Save as Template.